SAP IBP supports a powerful type of transformation that allows you to change the value of an attribute based on a calculation expression. This capability helps to reduce the number of stored key figures, when there is a use case to view the same key figure with some of the attributes transformed or offset at a planning level . For example: A user may want to see the actuals quantity for the same month in current year and previous year simultaneously. Rather than using two different stored key figures, attribute transformation allows you to use one stored key figure for the actuals quantity over time and a second calculated key figure that offsets the actuals quantity by a year. Period-based attribute transformations are easier to understand and examples are available in SAP Help and in SAP Blog. Non-period based attribute transformations are also supported but less examples are documented. A user may want to transform key figures on transportation lanes (ex: planning level WKPRODLOCLOCFR) from target location to ship-from location. Image 1 below shows a 2-stage network for a single product where the cutomer-facing distribution center (DCBin) sources from two plants SourceBin1 and SourceBin2 with some quotas. One of the outputs from inventory optimization is the optimal internal service level (aka internal non-stockout probability) key figure calculated at the WKPRODLOCLOCFR planning level (that is on a transportation lane). Similar key figures are dependent demand key figures, etc. A user may want to view this output key figure internal non-stockout probability in conjunction with recommended safety stock key figure in an excel planning view using the Product and Location (representing the target location) attribute combination. 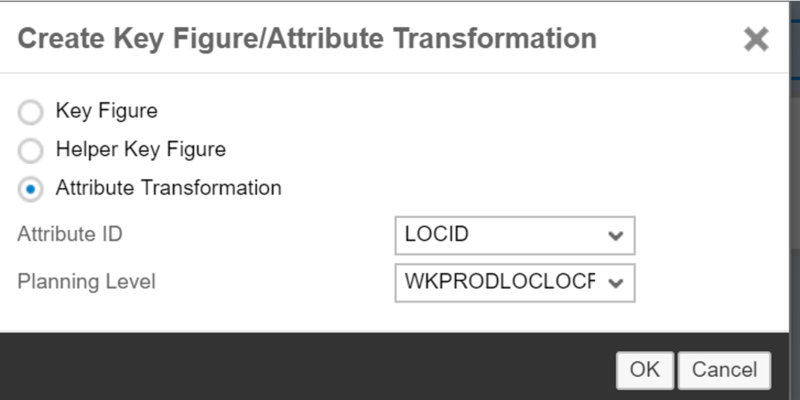 Without attribute transformation, the two options to achieve this is shown in Image 2 below. Image 2 shows, that in both views, the internal non-stockout probability is displayed at the target location (DCBin). With attribute transformation, we can display the value of this key figure at the ship-from locations (SourceBin1 and SourceBin2). Such a view is shown in Image 3. The configuration setup is discussed below Image 3. 5. Define the calculation as shown below by setting it to LOCFR and select NSPDISTRIBUTION@WKPRODLOCLOCFR as an input key figure. This calculation then transforms the LOCID vaue to the LOCFR value for this key figure. Attribute transformation is a powerful feature available in SAP IBP. It supports both period transformations (such as time offsets) as well as non-period attribute transformations (changing from target to source or vice versa, changing from component to output product or vice versa, changing from product to substitute product, etc).